Benedict. South Carolina State. Florence-Darlington Tech. Intelligence, beauty and power. Instantly, I was motivated to assist Mia in whatever way I could. This project was certainly going to take me out of my comfort zone of capturing landscapes and being in the woods capturing wildlife. I didn’t just want us to do a bunch of photos and post them on our social media platforms. I wanted to tell a little of these ladies’ story. It made me proud as a black man to be afforded the opportunity to capture the strength and intelligence of three of many black girls that rock. What these ladies have accomplished is what any father would want for his daughters to achieve. While our town of Latta, South Carolina is small, it is full of life and has produced some of the finest human beings one could ever meet. It is home to one of the best high schools in the state – Latta High School. And it is from this high school that these three ladies continued their educational and professional journeys. I don’t know if I’ve met anyone who is more passionate about what they do than Dr. Chereyle Rogers. Her profession as a counselor for the State of South Carolina has allowed her to gain insight on how to help today’s youth choose a different and more productive path in life. 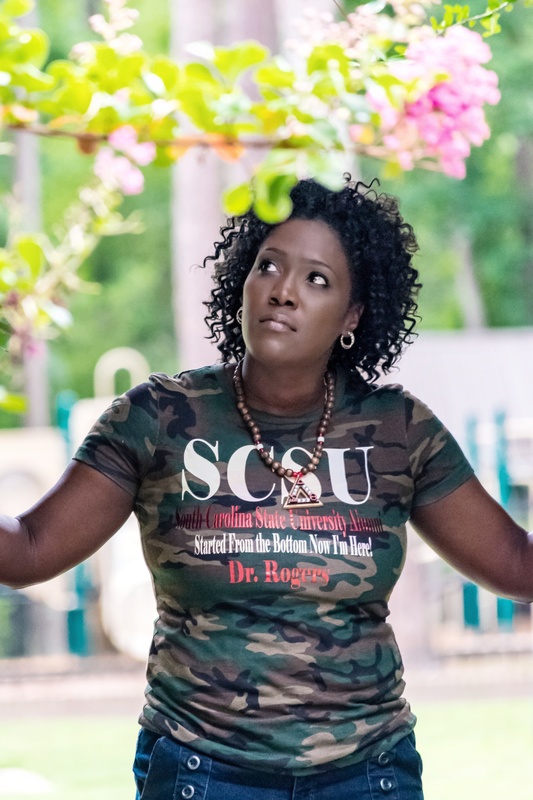 Dr. Rogers is actively engaged in improving the very community she grew up in. A few years ago, I had the opportunity to participate in an event she sponsored for the youth in the Latta community. In addition to being a counselor and inspiring youth in many different ways, Dr. Rogers somehow finds the time to to be a successful entrepreneur. Rock on Black Girl. Rock on! With an intellect that is just as bright as her smile, Amy Washington received her degree in nursing from Florence-Darlington Tech. As the only Registered Nurse working with doctors who are kidney specialists, Amy successfully manages the challenges associated with her demanding, but, rewarding career. The reward for Amy isn’t just from her compensation. She genuinely enjoys being able to help a patient get back to good health. Because every patient has a unique set of needs, it is Amy’s job to be able to adjust to those needs and inform the doctors of the specifics of each patient. We think the medical field has a definite winner! When we mentioned that Latta is full of life earlier, we also had Monica McClain King in mind. Monica’s star shines bright at PepsiCo where she works as an Account Executive. Equipped with a degree in accounting from Benedict College, it is inspiring to listen to Monica explain what her job entails and how she carries out her duties on a daily basis. One of the things that excites Monica about PepsiCo and that has gained her loyalty to the company is the diversity factor that PepsiCo’s culture is built upon. Monica says that it is truly a culture of inclusion regardless of gender, race, or religion. In today’s social climate, it is important that more companies adopt this idea of inclusion. We at Ascended Thoughts are proud of the accomplishments of these three young ladies. We are very much looking forward to our next round of Black Girls Rock to recognize more black women who rise above the obstacles to make a difference in our society. Our next shoot and post will highlight the accomplishments of black men from our community and what they do to be productive and active members in our culture. In the meantime, check out more photos from our shoot at Swan Lake in Sumter, South Carolina of these Black Girls that Rock! I love the Black Girls that Rock post. Beautiful pics and great stories. Hope to see youe next one. Please post at http://www.fabifabu.com/2017/08/06/inspiration-galore-project-party every Sunday until Wednesday!!. Thanks!! Thank you Fabiola! Always appreciate your support!